Ghosts, demons, and monsters aren't going to take a vacation, so neither can you. Whether you've been hunting the supernatural your whole life of just this summer, this book's got more than enough to keep you busy. From demon bikers to diabolical alchemists, evil never lets up in this collection of five adventures for the Supernatural Role Playing Game. 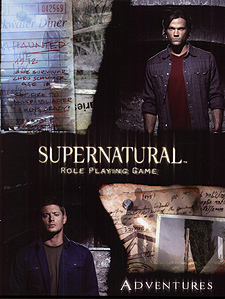 Bring your own hunters to the party or play as Sam, Dean, and other characters from the hit show on the CW Network. Whether you play each adventure as a stand-alone story or string them together as a mini-campaign, this book is the perfect accessory for full-throttle horror action-adventure in the world of Supernatural.